Otherwise you will likely be paying for upgrades that may not be required. To ensure BiFolds meet PAS24:2012 here are some of the changes required from the standard specification. The inner skin of glass will need to be a minimum of 6.8mm Laminated – this makes it much harder for a would-be intruder to gain access by breaking the glass as Laminated glass has a thin interlayer that holds glass together even when broken. Toughened glass is currently used in most BiFolds and has great strength against blunt objects. But it has weak points around the perimeter and breaks in to small pieces without making much of a noise that would perhaps otherwise alert neighbours. This Laminated glass unit should be silicone sealed into place between sash and glass as in the diagram below so that even if by some chance the beads are removed the glass adheres to the actual aluminium sash which makes it much more difficult to gain access. Anti lifting blocks or brackets are fitted to the spaces between panels and outer frame to limit the movement required to manoeuvre locks and keeps out of position. Document Q, who is responsible? 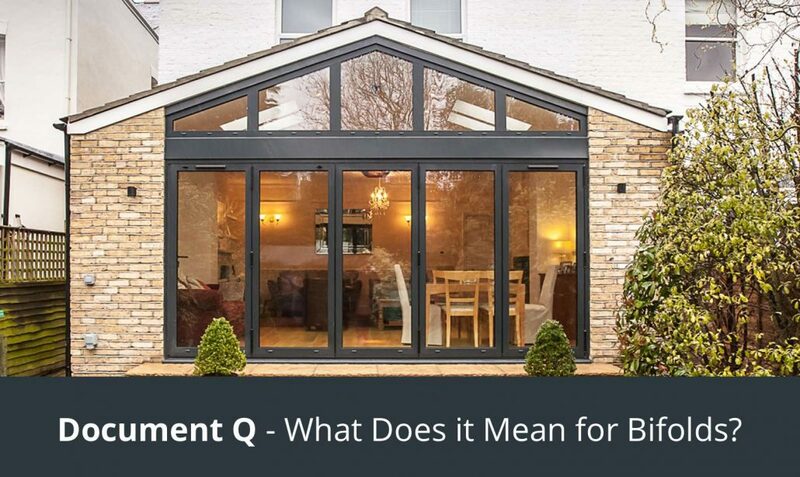 The person who orders the windows or doors must inform the supplier if the products need to be Doc Q compliant. The supplier usually does not have all of the relevant information to judge if Doc Q is required. It is then the responsibility of the supplier to ensure that the windows and doors supplied meet the Doc Q standard. Is Doc Q the same as Secure By Design? No it is not the same, many projects stipulate that the windows and doors must be Secure By Design approved. To achieve this, manufacturers are required to be certified members of the scheme. Certification gives quality assurance. 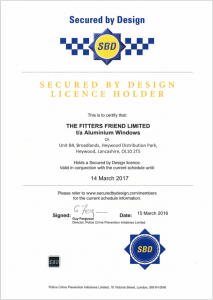 When a manufacturer wishes to comply with the requirements of SBD they must now submit the product range for certification. This involves submission to a test house, which may or may not be the Certification Authority (CA). A number of products, representing the whole range, are selected for testing and if they all pass they can be accepted into the certification scheme. The CA visits the production facility to ensure that the products tested are representative of the products supplied to the end user. This is followed by a programme of regular visits to ensure continued quality standards are met and that components have not been altered without informing the CA. During the course of a year the CA will remove a small number of products for re-testing. This is dependent on the number of products being produced or a number agreed with the manufacturer. Should any part of the security standard be changed/up-dated the manufacturer is expected to upgrade products to retain certification. http://www.aluminiumwindows.co.uk/wp-content/uploads/2017/03/document-q-e1490352475675.jpg 763 1280 Amy http://www.aluminiumwindows.co.uk/wp-content/uploads/2015/12/aluminium-windows-logo-e1449201239907.jpg Amy2017-03-24 10:50:112017-07-13 17:18:49Document Q – What does it mean for Bifolds?